On Saturday 18 February 2017 I married my best friend Paul. We had an intimate ceremony under the trees at Clontarf Beach with a few friends and family in attendance. My brother Deon was able to join us from South Africa and my niece Pia flew over from Perth. Our celebrant Anita Oates was wonderful and represented our love for each other eloquently and made sure we got hitched in a fun, relaxed way. 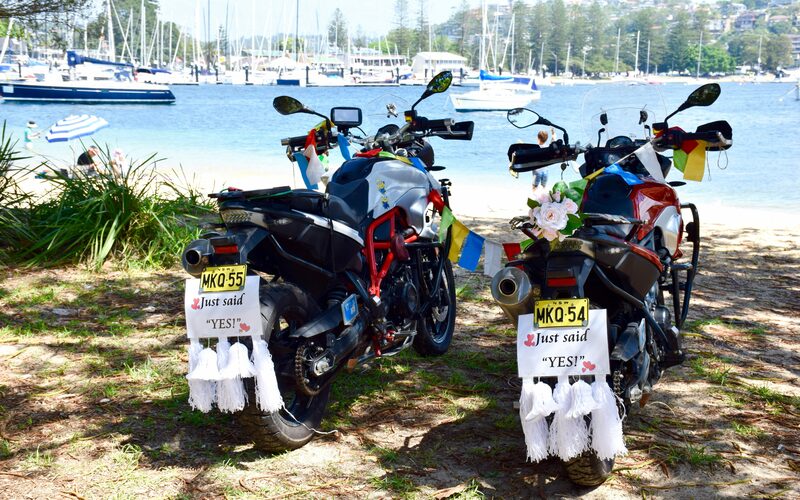 This day took us one step closer to our journey and we included our bikes in the ceremony. Paul and I conducted a “blessing of the bikes” and we asked guests to write wishes and prayers on Tibetan prayer flags strung across the bikes. The symbolism of the prayer flags is meaningful to us as they are used to promote peace, compassion, strength and wisdom. Tibetans believe that the prayers on the flags will be carried by the wind to spread goof will and compassion into all pervading space. Paul and I will carry these flags on our journey as a gift to ourselves and each other as family & friends. On our travels we aim to “do good as we go” and the prayer flags are in keeping with that focus. The prayers of a flag become a permanent part of the universe as the images fade from exposure to the elements. Just as life moves on and is replaced by new life, Tibetans renew their hopes for the world by continually mounting new flags alongside the old. This act symbolizes welcoming life’s changes and an acknowledgement that all beings are part of a greater ongoing cycle. This blessing was written not just for us as the motorcyclists, but for all of us a reminder of our vulnerability, openness and joy. And to bear witness to your life. Encourage you to be the best that you can be. And above all, bring courage to every adventure. Congratulations Maryna and Paul. I dreamed about you, Maryna, round about the time you were tying the knot! How weird is that? Thanks so much for your message Di! How amazing?! Thanks so much! Appreciate your encouragement!